St. Brigid, who lived in 6th century Ireland, was known for her healing and weaving abilities. It is she who came up with this particular weave design, often seen made with blades of grass. 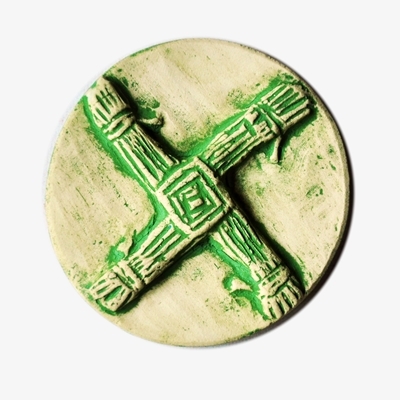 The tradition of making St. Brigid's Crosses on the 1st of February, St. Brigid's Feast Day, is still alive. This is a disk, or amulet, made for one’s altar or other special place. It is made from stoneware clay and colored in oxides. Green on white stoneware is available for immediate delivery, but it may also be ordered in a range of colors (see drop down menu).